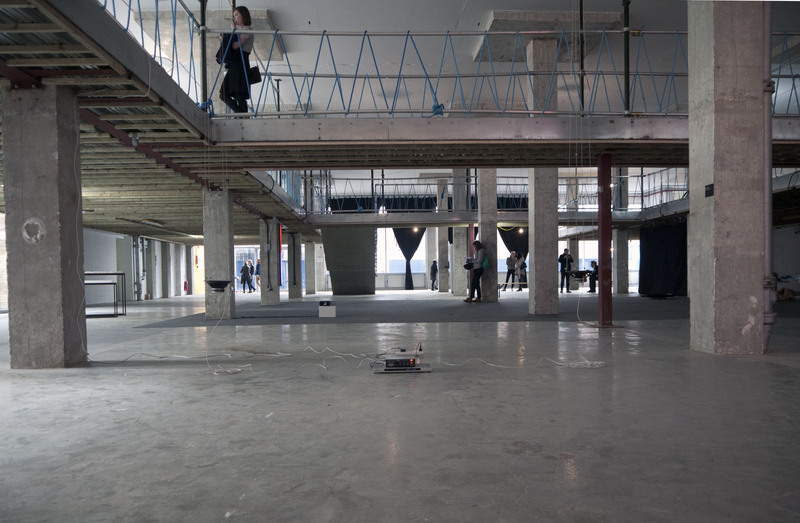 Persistent Matters: Image, Materiality at Second Home, Hanbury Street, London, May 8th -15th 2014. Image, Materiality, curated by Alexandra Hook, a second year student in Information Experience Design (IED) in the RCA School of Communication, and which included the work of a number of RCA students and graduates, was held in the vast ground floor space of the Atlantis building in Shoreditch, off Brick Lane. The space will soon become a trendy hangout for ‘creatives’, with its own bar and shisha lounge, but for the moment is a stripped-out concrete shell. This is a highly selective, preliminary report, not a comprehensive account of what was a large and fascinating show. There has been much talk of the ‘post-digital’ recently, but there are at least two definitions of the term. The first suggests that digital technology is so sophisticated and pervasive, and we have as a consequence become so emmeshed with it, that we no longer have to be preoccupied with, or conscious of, how it functions and can thus get back to the business of being human. The second sense is more literal: a return to materially based and hand-made ways of working. This show steers away from the first definition through its very foregrounding of technology, as well as embracing the second, in that several works are hand-made or make use of explicitly pre-digital media, such as audio-cassettes or the book. The ideological challenge to the idealist strain implicit in the first definition above needs to be exposed if we are not to be manipulated, assimilated and surveyed even more that we already are, and much of the work in this show constituted a rejection, if not an explicit critique, of this idealism. The following discusses a representative sample of the work in the show. Jamie Jenkinson’s Fan on Fan consists of a projected video image of the rotating blades of a white electric fan, projected through the rotating blades of the same actual fan. The action of the fan blades breaks up the projector’s beam into its constituent colours, which fire in a three-colour cycle at such a speed that we normally perceive them as their composite, ie white light. The fan blade’s moving-image counterpart, the shutter, is an essential component of the technology for shooting and projecting films, which depend on the discontinuous presentation of multiple images to sustain an illusory movement. Here the shutter, the invisible sine qua non of the technology, becomes both subject and structuring device. The fan forms the work’s subject in the image while the actual fan’s presence threatens to destabilize that same image, partly through obscuring its projected counterpart and by breaking the light down into coloured bands. The work is circular (sic), in that an aspect of its own technology becomes its subject matter, which is then recycled via a projection system that disrupts it even as it appears to figure or reveal its functioning. The balance of elements favours the material presence of the video projector and the fan, with the modified image a tentative, albeit necessary presence, whose main function is to refer the viewer back to the precariously sustained conditions of its existence. 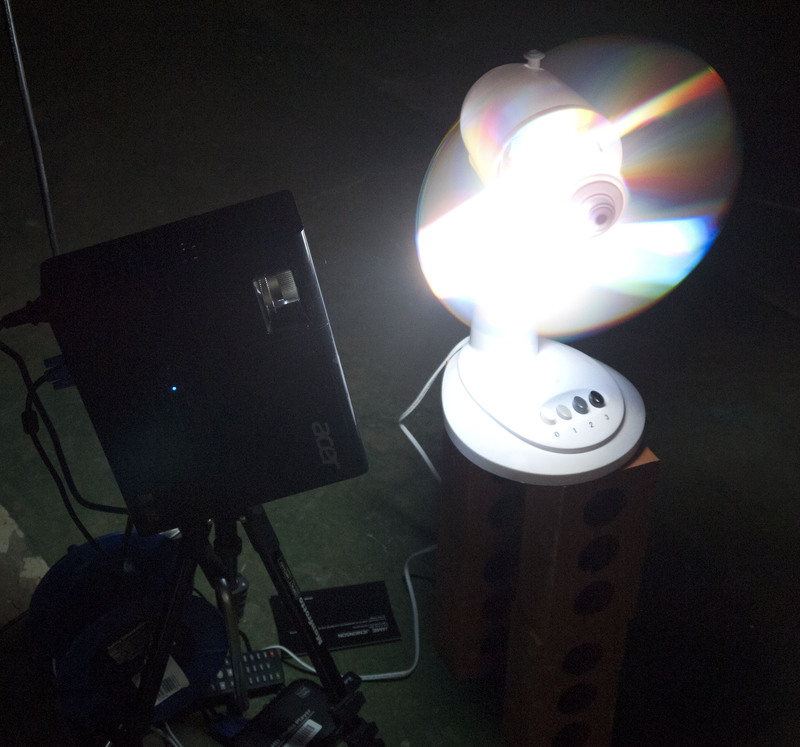 Fan on Fan reminds us that light becomes unruly when subjected to ordering processes. Its combined different wavelengths create complex problems in the design of lenses, for example, which have to be coated to eliminate colour-fringing, which is an effect of different wavelengths hitting the lens in slightly different places. 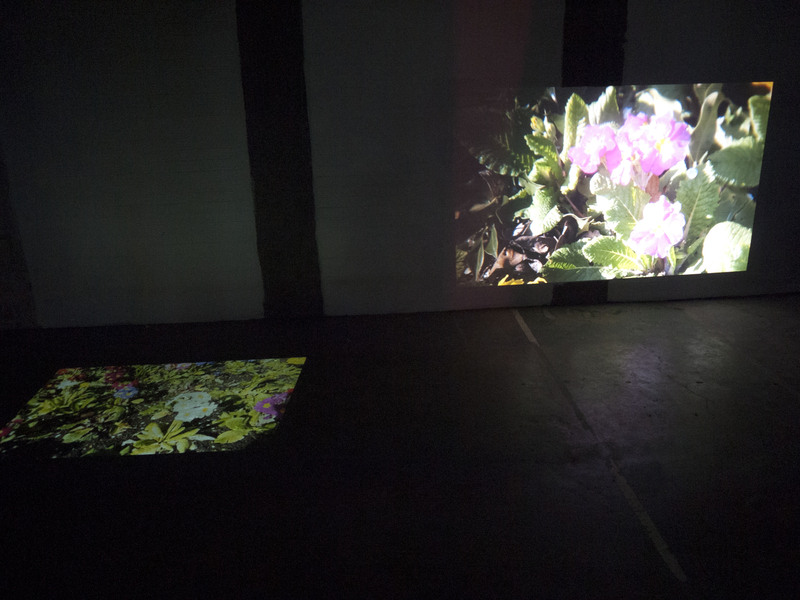 Amy Dickson’s Primrose (Primula) is a seemingly straightforward double video projection of spring flowers, shot with a hand held camera that moves sometimes steadily and sometimes jaggedly across its subject. The projection onto a wall, an otherwise straightforward configuration, is subtly subverted by the second, on the floor. This latter, which is necessarily seen from an acute angle if one is to keep the first in view, presents itself sometimes as an image and sometimes as a patch of kinetic colour. The two come to relativise each other in a simple reminder, or prompt, that we are looking at an image of flowers, not real flowers, to paraphrase the spoken monologue in David Halls’ seminal TV work This is a Television Receiver of 1975. The issues raised by Hall’s work haven’t gone away and were echoed in a few of the works in the show. Large projections on walls in big spaces often invite the spectators to immerse themselves in the image. Dickson’s piece counters such invitations. 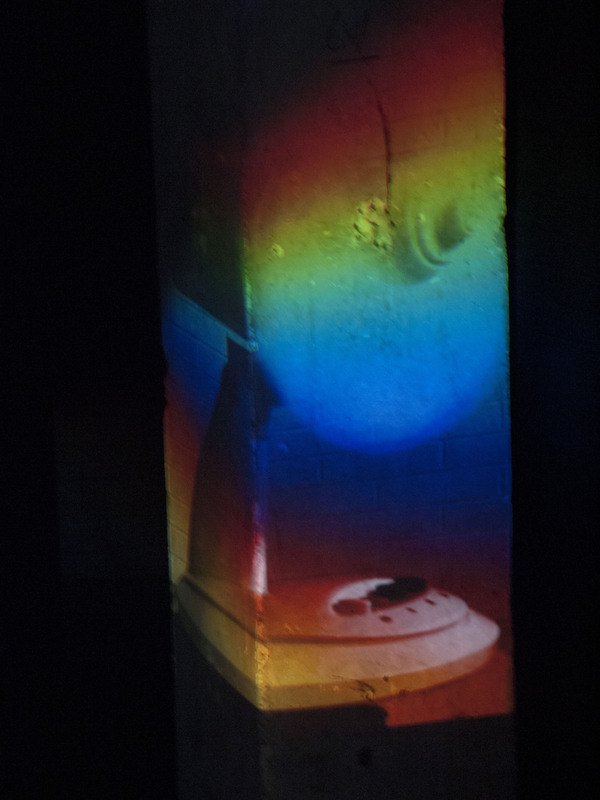 Another seemingly straightforward projection, Sally Troughton’s Set-aside (2013) establishes a simple situation in which the viewer becomes acutely aware of their psychological investment in the image. 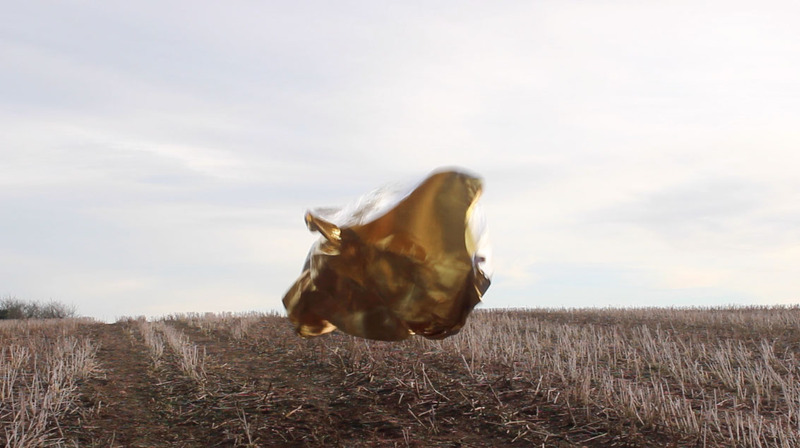 A gold and silver thermal blanket, attached to two cords held by an out of view operator standing near the camera, dances chaotically in a stubbled winter field. As the wind catches it, it forms ephemeral, billowing shapes, voluminous and bio-morphic, but much of the time it is caught by the stubble and lies inert on the ground. One finds oneself willing it to take flight and hence becomes aware of one’s palpable mental investment, notwithstanding the simplicity of the stimulus, in both the physical and mental sense. The stark contrast between ‘nature’ and the hi-tec fabric gradually breaks down as one realizes that the uniform and precisely aligned stalks of stubble similarly evidence the activities of highly sophisticated technology. Kelvin Brown’s Johannesburg Tapes (2014) consists of a series of audio recordings made on a recent Triangle Fellowship residency there. Brown interviewed a number of people involved in what was for many years the semi-legal or illegal South African music scene. A comfy sofa and headphones helped to ease the demands of attending to time based works in galleries, especially as there are several hours of listening here. All the work is presented on audio- cassettes, because this is how banned music was circulated in the Apartheid years. The cassettes thus join this floating archive, much of it music sent to South Africa from abroad, contribute to and comment on it, explicitly since some of the recordings discuss precisely this question of the music’s circulation. One consequence of the banning of any music considered to be subversive is that Johannesburg’s vast second hand record shops are some of the least interesting anywhere, dominated by Abba, Genesis, and Bee Gees LPs. The recordings can be accessed via the link below. A number of works asserted their physicality, their object-hood over and above anything else, even while pointing to strong contrasts between physical form / medium, and ‘content’. 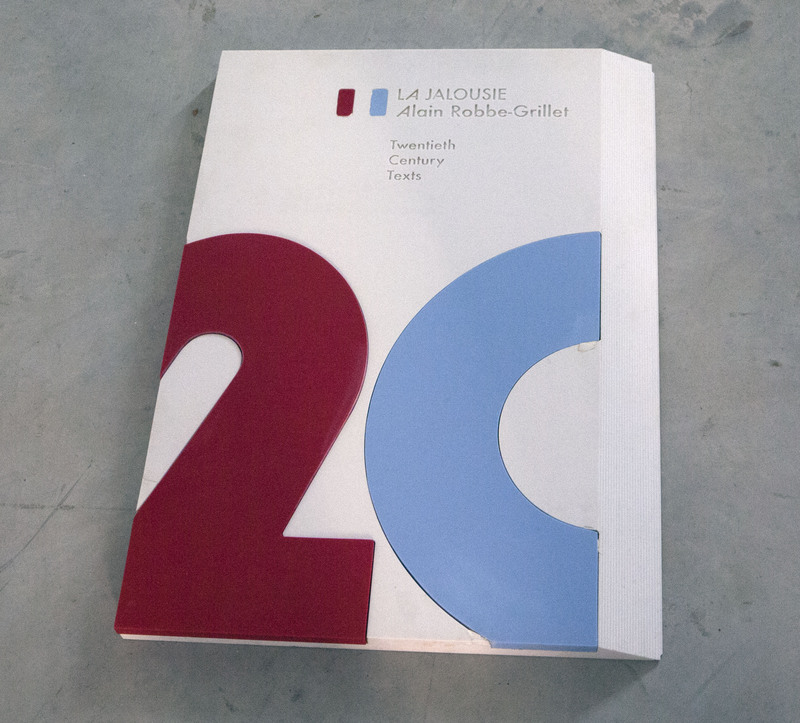 Matthew La Croix’s Untitled (2010) is a reproduction of an edition of Alain Robbe-Grillet’s famous 1957 novel La Jalousie (Jealousy). Moulded in Corian, a material used to make high-end kitchen work surfaces, the book is, in La Croix’s words, rendered: ‘entirely surface, demoted to an anti-text or an object in a material specifically man-made’. The book is reduced to its cover, yet it exists as a substantial thing. Placed on the floor, so that it could not thus be read, its outward form is further emphasized. Yet there is a kind of correspondence between the form of this precision-made quasi-sculpture and the book’s contents, since the latter is concerned with a minutely detailed description of the physical layout and construction of a house, and the surrounding banana plantation which is the novel’s setting, and which is itself described in precise geometrical terms and measurements. In another sense, one which gestures to the show’s ambivalent attitude to digital technologies, books embody all the virtues supposedly unique to computer functions: they are randomly accessible and re-readable, pages can be browsed –scanned- and revisited at the flick of a finger. Beyond this books don’t crash and aren’t dependent on imminently obsolete platforms. No batteries are required. Marianne Spurr’s Untitled (2014) was made from materials found on-site. 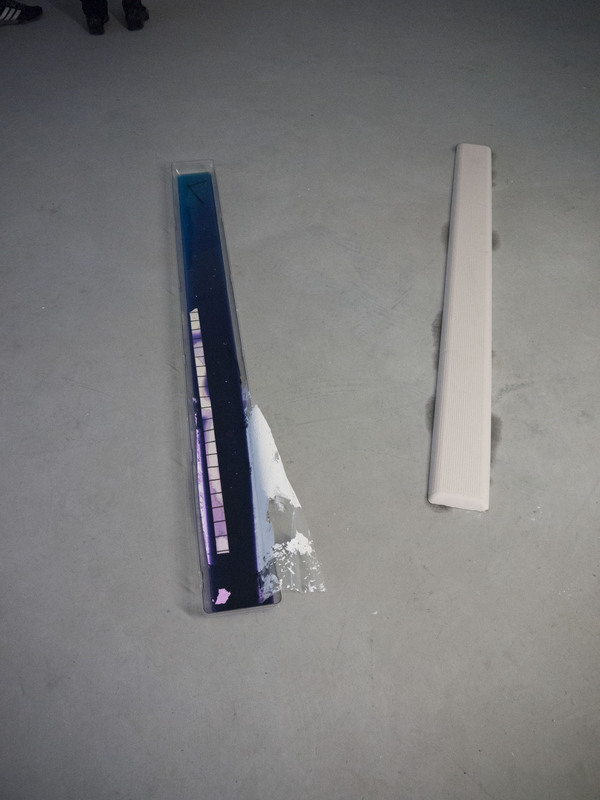 A cast was made from a fluorescent light fitting and both mould and resulting object shown side by side. Spurr’s sculpture, one of several floor works in the show, is emblematic of the way good art comes out of the limitations imposed by the necessity of using whatever is to-hand. It offers a new kind of take on the idea of site-specificity. We see both found object, the plastic cover for the fluorescent tube, and the white plaster cast taken from it. The work is both found and made, and raises interesting questions about originality and making, and the originality of making: is the cast itself original or a kind of object that is found at one remove, in the sense that, though literally made by the artist, it is derived from something that was not? Does this make it half-original, and is that possible? Like Matthew La Croix’s Corian book, the sculpture is a kind of negation of that from which it is derived, yet connected to it. Beyond their intimate formal fit, the plaster cast cannot function as a light, yet it is highly reflective and hence light-like, much lighter indeed than the light fitting from which it derives.